Do not be lulled into false sense of security by budget announcements, nurses warn RCN leaders. A group of nurses has written an open letter to the RCN's leaders demanding they 'be militant' and consider industrial action over unresolved pay issues. The online letter, which is signed by several RCN members and is being circulated on Twitter, criticises what it describes as the college's overly positive response to the recent autumn statement. During last week's budget, chancellor Philip Hammond pledged to make funding available to cover a pay rise for nurses, although the figures involved will not be known until April. 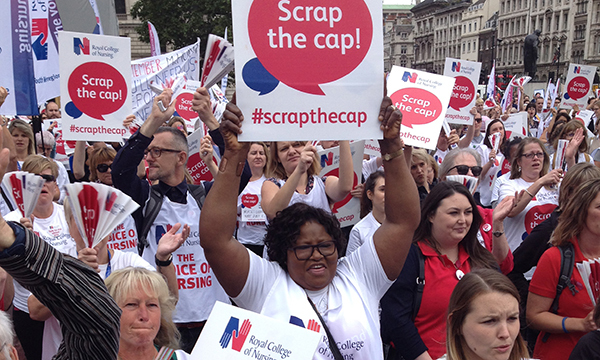 After a sustained campaign by unions – including the RCN – health secretary Jeremy Hunt had previously announced in parliament on 10 October that the 1% cap on public sector pay rises would end after seven years. Responding to the budget announcement last Wednesday, 22 November, RCN general secretary Janet Davies said: 'The chancellor has clearly listened to the tens of thousands of nursing staff who’ve been campaigning for fair pay, and he was right to address their concerns. However, the authors of the letter wrote that the RCN's leaders were 'prematurely celebrating a victory' that nurses are yet to have and they call on them to discuss industrial action. They wrote: 'The RCN has somehow conjured up positivity from a budget that contains nothing but fear and failure, not only for nurses and the NHS, but for the whole of society. 'We the undersigned call on the RCN leadership to hold an extraordinary executive meeting to discuss industrial action as the only response to this budget. The nurses added that the RCN 'cannot wait' to be the voice of nursing, but rather 'it has to be militant and it has to act now'. They finished the letter as follows: 'Empty promises are not a victory. An RCN spokesperson said: 'The first stage of our campaign is over after forcing the government to scrap the pay cap. 'The second stage is potentially more difficult as we focus on influencing politicians and using the Pay Review Body process, which goes through to spring next year, to demonstrate that nursing staff deserve a pay rise.